In the small basement rehearsal room of an unassuming council building in Koto Ward, the last thing you would expect is the kind of musical experience that transports you back in time to an ancient Japanese setting. Sitting in front of the players only a metre away that first beat of the taiko drum is an unforgettable, almost palpable aural sensation. The group – or taiko-shudan – takes their name from a legendary folk tale character, the mischievous imp Amanojaku, said to symbolize a rebellious spirit who goes against conventions. Amanojaku, led by its founder Yoichi Watanabe, was one of eleven groups who performed for the “Summer Concert: TAIKO Drums in Tokyo”. With a musical history spanning thousands of years, roughly beginning from the Yayoi period (300BCE – 300AD), the modern form of taiko as an ensemble instrument in fact began from the Fifties and rapidly gained popularity, arising in taiko groups all over the US, Canada, UK, and Australia. For Japanese people, the sounds of the taiko have long been associated with summer festivals. The taiko players wearing the traditional hapi-coat, surrounded by dancers in yukata, are a familiar and nostalgic sight. Taiko was also associated with celebrations such as a good harvest or a bountiful fishing catch; at other times it was used as a tool for encouraging warriors in battle. With all of these various associations, taiko can be seen as a positive force, a way of healing the soul. The summer concert held at Tokyo Bunka Kaikan was a timely event, and it was impossible not to see the connection between taiko with its inherent Japanese-ness. Amanojaku’s leader, Yoichi Watanabe, is a veteran of the taiko, having played the instrument for forty-three years. Asking him what his initial catalyst was in wanting to play, he explained that as a young boy growing up in shita-machi, or downtown Tokyo, hearing the sounds of taiko at the summer Obon festivals was an important part of daily life for him, so it was only natural that he began to play it himself. 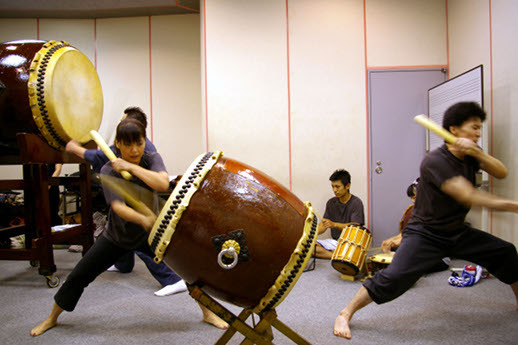 Of course, for anyone looking at taiko players, you can see that it is not just about hitting the drum, but about physically using your whole body. Watching the six-player shudan of Amanojaku at the rehearsal room, I was reminded of my own childhood learning the rigorous discipline of karate kata – formalized movements that are akin to slow dance – especially as the three players in front synchronized their arm and leg movements. Watanabe was delighted when I related this observation to him and indeed told us that playing taiko is “all about expressing with your body, your spirit”, and explained that they began their song with a kamae or a “loud call”, similar to that used in karate. 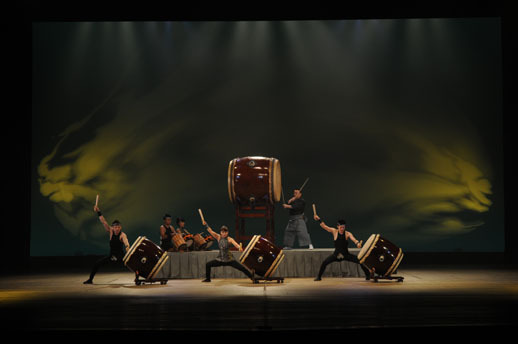 You could almost say that taiko is an extension of the Budo (“Way of the Warrior”) spirit: evidence of the deeply embedded roots of taiko within Japanese culture. Curious about how Amanojaku lived up to their name of the rebellious spirit, I asked Watanabe about their renowned techniques of fusing traditional Japanese sounds with Western rhythms such as Latin beats. “Of course, I wanted to impress people with a new interpretation of the taiko, but it was also about creating a new culture through tradition and Westernized rhythms. I saw that all the various sounds and rhythms of different cultures were all connected, so that you could apply it to a Japanese sound.” To demonstrate this, he played a typical Latin mambo rhythm on the taiko, and created an authentic sound simply by using other parts of the instrument; such as scaling across the tacks on the side that hold down the skin of the taiko. By merging these rhythms into traditional taiko, he believed that his team would become a unique and outstanding shudan. Certainly if you look through Amanojaku’s concert records, and notice the many times they have played overseas, Watanabe’s aims seem to have been achieved. One of Watanabe’s most significant experiences overseas were his extended stays in Brazil, where he taught many nikkei (Japanese immigrant) students. He related how for these students whose backgrounds meant they were displaced from Japan, taiko became a kind of status symbol, and how through playing and practicing with Watanabe, their identities became more nihonjin than that of his Japanese students back home. Their energy and enthusiasm inspired him; playing the taiko was a way for these Brazilian students to search for their roots. 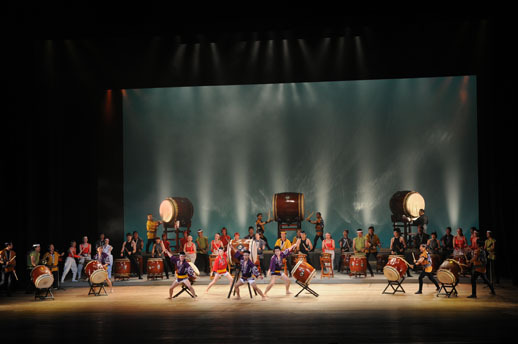 Interestingly, on the day of the concert, Amanojaku’s performance was characterized by its noticeable simplicity, purity and aim to go back to the roots of wadaiko – the Japanese taiko. One could not help being impressed by the first two shudan to go on stage, with their clever choreography, range of different instruments such as flutes and smaller taiko, and even moments of humour. Then, when Amanojaku came on to perform, one noticed how much presence they commanded. Six players, wearing cool black, played emotional, compelling drumbeats that went straight to your heart. This seemed to me the ‘essence’ of taiko. I remarked on the purity of their performance to Amanojaku in the backstage rehearsal room. Watanabe said that they were in fact aiming for a more stripped-down style this time. He explained that it was important to try out new styles but also maintain the roots of the original; to not cheapen their performance with tricks but express the heart of their music as one group. Other players also noted the feeling that there was nothing on stage but you and the taiko, and the more they played the closer they became with the drum. Another player stated: “Everyone’s backgrounds may be different, but since joining Amanojaku…we became one, one heartbeat.” The most important thing for Watanabe was that the audience gets a taste for the Japanese spirit through taiko. Not simply background music in a summer festival, perhaps the taiko even holds the very key to the soul of Japan and can become a way for people to explore their identity.